How Do I Know if I Need an AC Repair? When is the Best Time to Schedule Annual AC Maintenance? Schedule maintenance during the off-season to experience streamlined service. To keep your system running efficiently from one cooling season to the next, annual maintenance can significantly save you money and help avoid the most common problems that occur with air conditioners. AC Plus recommends pre-season maintenance each year to extend the lifespan of your system and to ensure when you do need an air conditioning repair in Hesperia, it will most likely be a minor issue, such as a worn out component replacement. 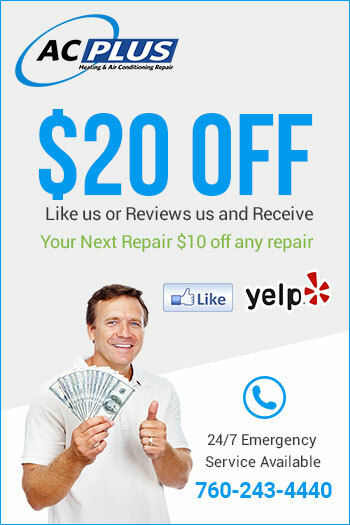 How Much Should I Spend on an AC Repair? It's not always an easy decision choosing from an air conditioning repair in Hesperia and a system replacement. If your AC is 10-15 years old, it may not be worth the costs involved in calling a repair tech. If the repair costs more than half the price you paid for the system, it may be in your best interest to start thinking about a replacement unit for your home or business. AC experts recommend working with a reputable heating and cooling company that you can trust for honest answers to your questions. Our technicians at AC Plus can come out, inspect your system, and give you professional advice on whether you should invest in a repair. What Does it Mean That a New AC Could Save Me Money? While you may think of replacing your air conditioner as an expenditure, replacing your old system with a new one could actually prove an investment over time. A newer, more efficient system will save you energy costs month after month, that will add up over time and could actually end up paying for the system in 20 years. Before you purchase a new AC unit, find out whether a cost-effective air conditioning repair in Hesperia could restore its function and extend its lifespan- call an AC Plus expert for a service visit. 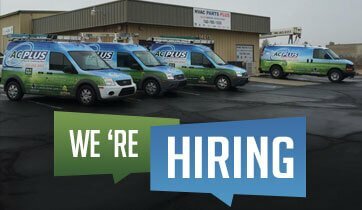 At AC Plus, we have your best interest as our prime focus of attention when we come out and troubleshoot your system or provide a repair. Our goal is always to provide exceptional service that is designed to save you money while maintaining a comfortable temperature in your home or place of business.